A professional MMA fighter is commonly described as deadly, fearless and disciplined amongst other adjectives. Out of hundreds of fighters in the history of unified rules of cage fighting, only a handful are able to stand out in terms of consistent performance, outstanding technique and inspiring stories to make the hall of fame and be remembered as ‘World Class Fighters’. Others may strive to stand out in the homogenous background of large framed, ribbed, heavily tattooed fearsome looking men with short crop hair by either having a outrageous personality or unique fighting style. In the first two months of 2015 UFC kicks starts the year with two star fighters, Anderson Silva in 31st Jan followed by a title fight with Ronda Rousey in Feb. Beyond the glare of these bright stars, one may also like to follow the progress of three less typecast MMA fighters. 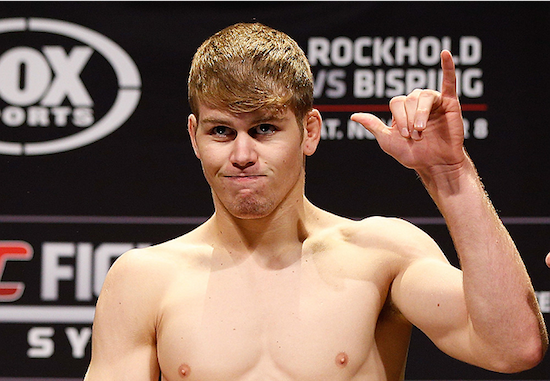 Many years later I went to a prominent MMA fight event in Australia and when Jake Matthews was called onto the ring, I recognised him straight away as the “Justin Bieber” that fought in the town hall some years back. Over the years he had enhanced his technique and clearly capitalised on his greatest strength: he is an extremely decisive fighter. Regardless of who his opponent is, Jake Matthews seems completely unaffected. He simply goes onto the ring, utilise everything he worked on, fight the fight then win. He went on to win a number of professional MMA fights and until his second UFC win in November 2014, at the age of 20 he remains undefeated. Dana White hailed him as the Australia future star of MMA. We should expect to hear a lot more of his name this year. Take that, pretty boy Justin Bieber.